Detailing the physical features, habits, territorial reach and other identifying qualities of the Scarlet-Bodied Wasp Moth. 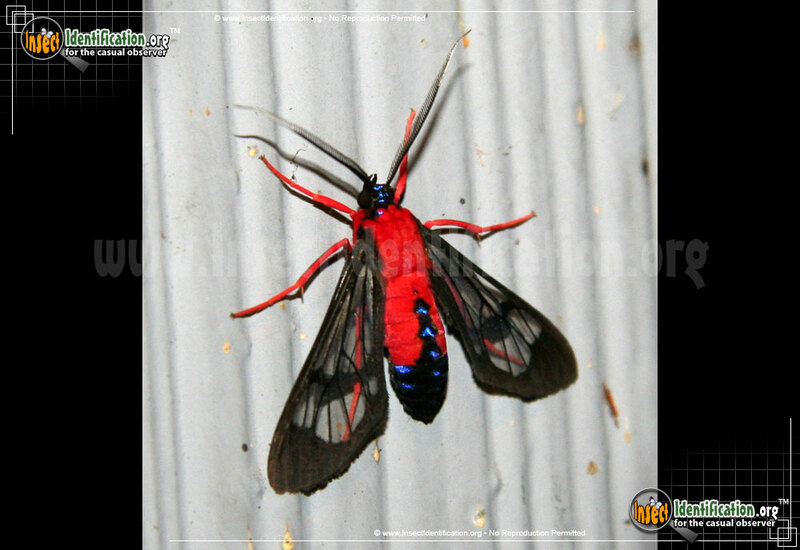 The bold and colorful Scarlet-Bodied Wasp Moth effectively uses warning colors to avoid common moth-eating predators. Scarlet-Bodied Wasp Moths are members of the Tiger moth family. Like their relatives, they are colorful and brightly patterned. Wingspans can stretch more than 30mm (1.2 inches). Part of the body and its legs look flocked in red. The black head and lower part of the abdomen are covered in glittering blue spots. The rest of the body is red. They are effective mimics of wasps and are distasteful to animals that typically prey on moths, like birds, bats, and lizards. This species is at home in the warm states of the southeastern region of the U.S.. They prefer coastal areas and are active from late spring through summer. Look for them on or near aster flowers, the preferred feeding plant of the caterpillar, but also on related plants. Caterpillars are yellow-bodied and covered with a thick coat of white spiky fur.